CLEVELAND (AP) When all else fails, the Tennessee Titans know they can turn to Ryan Succop. ”That guy’s money,” Titans quarterback Marcus Mariota said. Succop’s fourth field goal – a 47-yarder with 1:55 left in overtime – extended his NFL record for makes inside 50 yards to 55 straight and sent the Titans to an ugly 12-9 win on Sunday over the winless Cleveland Browns, who also lost durable Pro Bowl tackle Joe Thomas with a triceps injury. Succop’s clutch kick enabled the Titans (4-3) to get their second win in six days and kept them tied for first in the AFC South. Succop made five field goals in Monday night’s win over Indianapolis, and then converted on kicks from 43, 23 and 46 yards before missing a 53-yarder with 8:44 left in the fourth quarter. However, with the Titans and Browns headed toward a tie, Succop delivered. Browns rookie Zane Gonzalez forced overtime by kicking a season-long 54-yard field goal with 47 seconds left in regulation to tie it 9-9. Gonzalez added kicks of 31 and 47 yards. But the Browns (0-7) committed 12 penalties and dropped to 1-22 in two seasons under coach Hue Jackson, whose future is becoming less certain. Cleveland’s troubles worsened as Thomas, a 10-time Pro Bowler, missed his first play in 11 seasons. Thomas went out with a triceps injury that snapped his streak of 10,363 consecutive offensive plays. The No. 3 pick in 2007 has been the lone bright spot over the past decade for Cleveland’s franchise, and seeing him leave in distress added more pain for Cleveland fans at the end of their ropes. Thomas will undergo an MRI on Monday and it’s not known how long he may be sidelined. ”I’m definitely proud getting over that 10,000 milestone,” Thomas said. ”I knew it wasn’t an infinity streak. I was enough of a realist to understand that. It was just a matter of time. Tennessee safety Kevin Byard had three interceptions – two off rookie DeShone Kizer, who was benched in the second half by Jackson for Cody Kessler. In overtime, Tennessee’s Brian Orakpo and Derrick Morgan combined to sack Kessler inside the Cleveland 10. The Titans took over near midfield and following a few short runs, Titans coach Mike Mularkey put the outcome on the foot of Succop, who pulled his initial attempt wide left as play stopped for the two-minute warning. But there was no doubt on his next kick, sending the Titans victoriously into their bye week. Tennessee’s offense sputtered all day as Mariota couldn’t get anything going despite Cleveland missing two starters in the secondary. Mariota finished 21 of 34 for 203 yards. 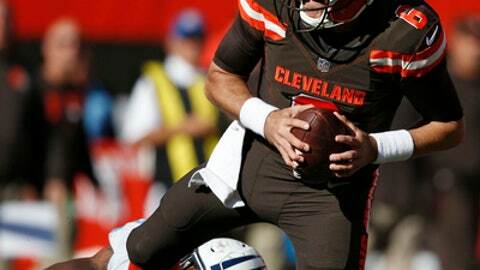 Cleveland’s quarterback issues remain paramount. Kizer started after a one-week benching because of turnovers. He threw two picks before Jackson had seen enough, pulling him for Kessler, who was inactive for the first six games after making eight starts last season as a rookie. Kizer was 12 of 20 for 114 yards. Kessler 10 of 19 for 121. Jackson defended his decision to sit Kizer, who has thrown 11 interceptions already. ”I can’t worry about confidence,” Jackson said. ”You guys keep talking about confidence. We are in the business of winning games. This is a performance-based business. If you turn the football over in the National Football League, you cannot play. It is just that simple. Everybody keeps talking about confidence. Titans: TE Delanie Walker was carted off the field early in overtime with a sprained right ankle following a 16-yard reception. He had seven receptions for 63 yards. … G Quinton Spain was taken to the locker room in the second quarter with an unspecified injury. Brian Schwenke replaced him on the left side. Browns: DT Trevor Coley (stinger) was hurt in the fourth quarter, but was cleared to return. Cleveland’s long list of infractions included four false starts and an offside on the opening kickoff. Browns wide receiver Kenny Britt had two catches for 7 yards. He was sent home and fined last week for missing a curfew in Houston. After he failed to come up with a pass in OT, Britt stayed on the field and appeared hurt. Cleveland fans booed him when he got to his feet. Titans: Bye week before hosting Baltimore on Nov. 5. Browns: In London to face the Minnesota Vikings.